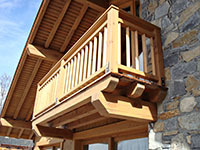 Situated at the heart of Méribel, our company offers its services for all types of joinery work for buildings, furniture and renovations of chalets and apartments for clients seeking the very best quality of workmanship. 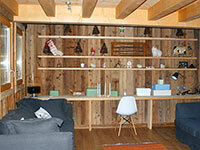 To do this, we examine your interior and exterior joinery projects with you. Whether you have a heritage style, a traditional style or a more contemporary style in mind, we can optimise space and volumes through the use of wood: a healthy, natural and living material. We offer you a wide range of products to enhance your interiors and exteriors, combining style and quality with respect for the environment, thus ensuring a complete and personalised service. We can advise you on all your exterior projects, so that you can add your personal touch. We design and produce exterior features such as French windows, front doors and shutters that will guarantee good insulation for your home. We design canopies, balconies, terraces and spaces that reflect your needs and desires. We design and produce kitchen fittings and lofts, but also entire interiors, according to traditional joinery techniques. We bring your projects to life, whether you have designed them yourself or had them designed by your architect. From the designs to a bedroom, to a bathroom with character to a library or bar, your interiors can be created in either a modern style inspired by the latest trends or a classic, luxurious and refined style. Numerous opportunities are also available for your standard, prefabricated or made-to-measure projects. You can rely on our creativity to bring your exterior to life.